Today was such a marvelous day in South Carolina that I just have to share a few tidbits, especially since there were a few lessons thrown in for good measure. I’m skipping the part about insomnia, something I’m always plagued with the night before a big event like the Cooper River Bridge Run. You’d think I was expected to be a front runner or something! So I got up at 4:30 a.m. and headed off to Charleston to “get over it.” The race was to begin at 8:00, and since I was in the K-group, I figured it’d be 8:30 before I crossed the Start line. Boy, was I wrong. 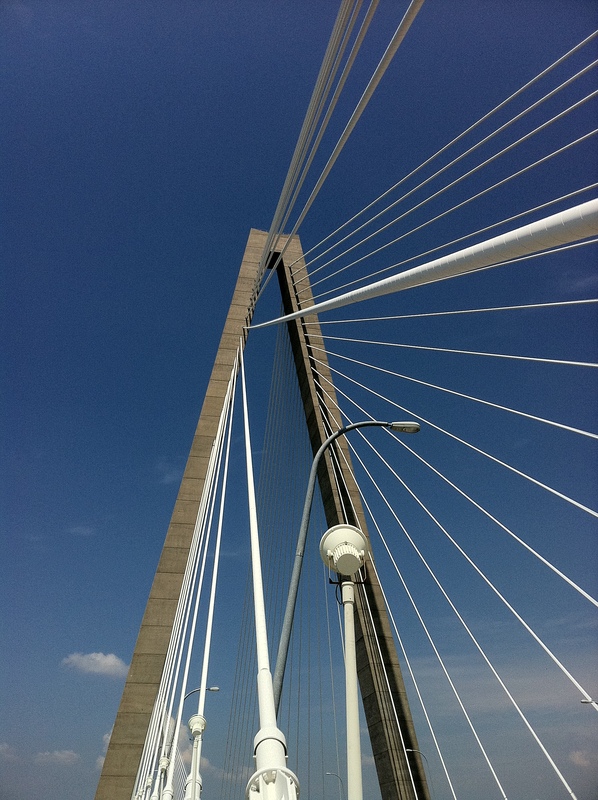 Walking and jogging, I crossed Shem Creek and headed toward the bridge. One advantage of being at the back of the pack is that the people there don’t take themselves so seriously. They laugh and tell funny stories and encourage one another. They also take time to stop and take pictures. My favorite family shot was of a couple cradling a baby between them. The baby was wearing super size sunglasses, and the father had some weird hair going on. I think it was a wig. I smiled as I thought of how neat that picture would be to the family as the child grows. As I passed other walkers and joggers, I overheard snippets of conversations, some of which were quite interesting. About three miles into the event and almost halfway over the bridge, I heard a man say, “Sometimes I think it’s just pure luck.” His walking buddy replied, “Yeah, but perseverance is important too. Just sticking to something and not quitting can make a big difference.” I wondered if they were psychologists, career counselors, professional employees, or regular guys who were trying to figure things out. Whatever their status, their philosophy applies to just about every area of life. And the music! Oh my gosh, it was fantastic. That’s an understatement. The bands and the sounds they made were awesome beyond words. Some were so good that race participants took a break to dance along the way! At a street corner in downtown Charleston, we were greeted by an Elvis looking crooner with a great voice. The band performing at the park was ultra talented and entertaining. So were the men and women who danced on stage. Their costumes were original and “fun,” and their joie de vivre was contagious. And the food. It was great too. I sampled an apple, some ice cream, and a bagel. Oranges, bananas, yogurt, and water were available too. The vanilla and chocolate ice cream tasted so cold and creamy as I stood listening to the band on stage and watching the dancers. I looked up at the clear blue Carolina sky, glimpsed the American flag, and then caught sight of a father dancing with his daughter on his shoulders. What a morning! To no avail, I tried to get together with Lauren and Kelly. I didn’t see Ben, Lisa, or Lynn either. Still, it had been a fun morning, and reluctantly I left to walk towards the busses that took race participants back to Mt. Pleasant. On the bus, I sat next to someone who had completed the Chicago Marathon, and I enjoyed listening to her story. Tonight as I remember all of the upbeat sights and sounds, there’s only one downer. Not only after we got into the city, a man missed his footing somehow and fell to the sidewalk. I heard a couple of people scream, and startled, I turned just as he hit the pavement, blood gushing from his forehead. I hope he’s okay tonight. And I hope the 44,000 folks who “got over it” had a swell time. And I hope you’ll join us in 2013. I always look forward to your Copper River Bridge Run post. It’s a nice intro to spring. One of these days I’ll make a run. I’d especially like to do the Provo Marathon/10k one of these days. That’s my goal for next year or the year after.